Last fall I completed two projects from my garage: the hutch and the dresser. As winter rolled in, I said good bye to the idea of getting anything else done. I spent the colder months snuggling on my couch with a warm beverage and dreaming about what I would do when it finally warmed up again. That time is now upon us. I knew I wanted my first project of the year to be Milo’s chair. I’ve been storing this since about August. My mom and sister had come to visit our new house and I took them to the Habitat Restore. I can’t remember if I was looking for anything specific, but we had just moved from a 2 bedroom apartment to a 3 bedroom house. I’m pretty sure I wanted anything to fill my newly acquired space. That weekend they had 50% off all furniture. Now The Restore has great prices anyways, but when furniture is 50% off you better believe I’m not leaving without buying something. I’m sure what I wanted at the time was a couch. I got something better: a chair for Milo. It’s not the most beautiful piece of furniture. In fact, it was the Charlie Brown’s Christmas tree of merchandise. They didn’t have it with the rest of the sofas and chairs, it was tucked away in a corner. So unloved they were practically giving it away with a price tag of $10. Yes, $10 and that was before the weekend discount. I saw so much opportunity with this chair. I mean, I didn’t want that chair in my house. But that chair with new upholstery could be amazing. I had seen tutorials on Pinterest figured it would be easy to tear the thing down to bare bones and give it new life. My mom insisted on buying it for Milo. Even if it had been the full $10 I’m sure she would have bought it. But at $5, we pretty much robbed them. I put the chair on the backburner because there were easier and more urgent projects to complete. At the time, Milo was 7 months old and not even crawling. He didn’t need the chair any time soon. I’m glad that I was patient because it gave me a chance to show my mother-in-law the chair. Now many of you don’t know my MIL, but she knows everything related to interior design. When I told her about my plans, her response was “I recently read how you can paint upholstery. I can send you the link if you’d like.” So she sent me the link and I watched the video. I was definitely intrigued, especially because it would require a much smaller skill set. I made my mind up that painting was the way I would go, and just needed spring to come so I could get started. The plan was for the chair to go in Milo’s room. It would be his own special place to sit and read. I would have bought either a dark brown or black paint, something neutral that would go with anything. But I had to ask myself, “What would Nick do?” He would buy something bright and colorful, so I settled on a blue. Now I’ll be honest, I went with a cheap Walmart paint. 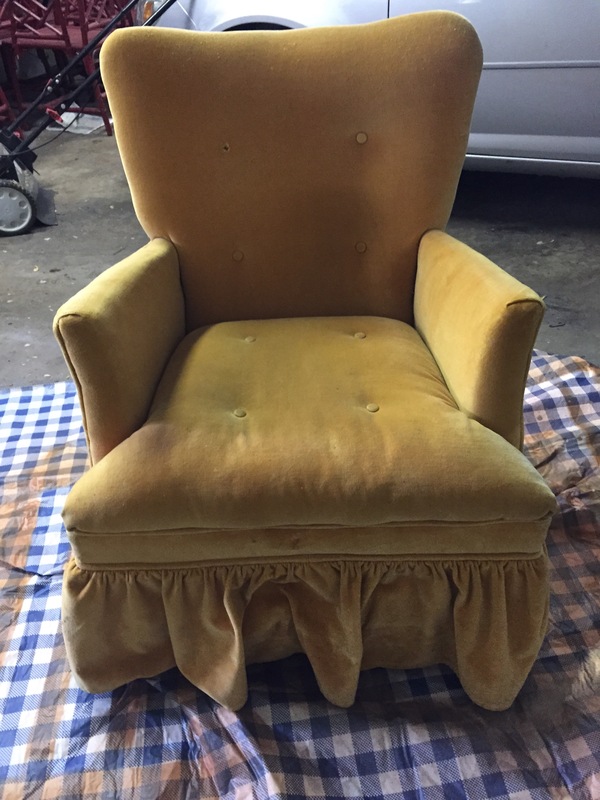 I’m aware of the Annie Sloan paint and that I probably good have gotten even better results with it, but I wasn’t willing to pay Annie Sloan prices on my first project. Especially one for a toddler who is going to stain this thing like crazy. I won’t go into a tutorial, you can learn from the masters at Better Homes and Gardens if you’re interested. But I will give some pointers: when they say wet the fabric, they mean get the darn thing wet. Chalk paint is thick and it doesn’t spread easily without water. The idea of watering my canvas was so foreign, I was really shy on the water the first coat. I learned the second time around. Another thing I thought was crazy: sanding the fabric between coats. Again, the first time I was so timid. I’m not sure if the sandpaper actually touched the chair. But sanding actually makes the fabric smooth, so put your elbow into and don’t be afraid. I had pictured this perfectly blue chair. 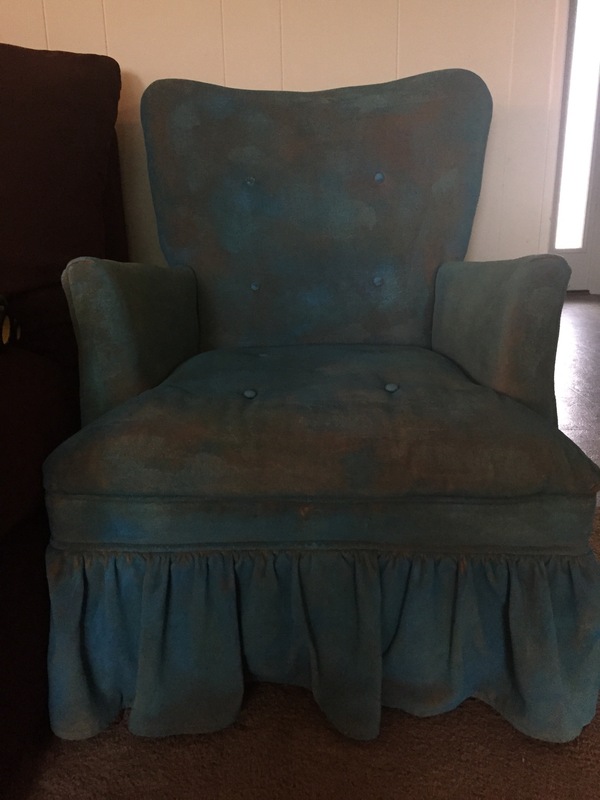 But between buying a really light color to paint with and not using proper technique, I got a chair with a little more character. I still couldn’t be happier. I think it looks eclectic, which is totally my style. Along the way, I also had a change of heart about where it would go when it was finished. The first time Milo saw the chair, he got this big grin and climbed right up in it. I realized how important it his to give him his own space, something to claim as his own. 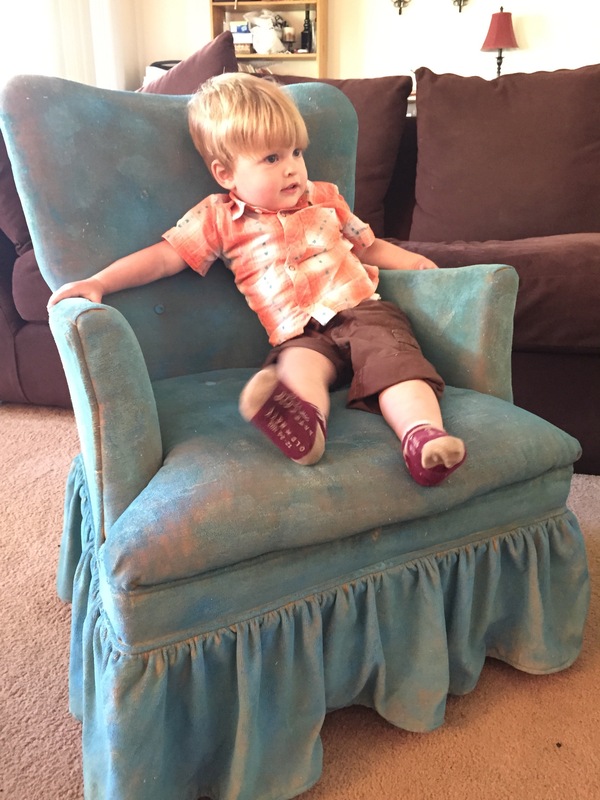 So even though it throws off the rest of the room, Milo’s chair is in the living room. For the first time when we’re all hanging out, Milo has his own place to sit. Although, Milo doesn’t actually sit very often. So he has his own chair to climb on and hang off of. This project was really good for me. I had to admit to myself that I’m just a beginner and wouldn’t get perfect results. I made some mistakes, but nothing you wouldn’t expect when trying something new. I’ll get better at it, I just need more practice. As fall is rolling in and winter is soon to follow, it was time for me to get back out to the garage to complete another one of my projects. Mostly because I don’t want to be out there when it’s frigid, but also because it would be nice if my husband could park his car in the garage when the frost hits. Like the hutch, the dresser comes with a story. Before we came to Bartonville, the church had been renting the parsonage out (the pastor’s husband was also a UMC pastor and they lived in his parsonage). I don’t know all of the details, but the tenants were awful. They got behind on their rent and had completely trashed the house. At one point, a nuisance notice had been posted by the county. They ended up being evicted. While they took most of their belongings, they left a lot of junk behind. A lot of junk. There were 7 TVs in the garage, along with a weight bench, some miscellaneous free weights, a patio chair, and this dresser. While the rest of the junk was being tossed, Vern (the man in charge of renovating the house for us) didn’t feel right junking the dresser. He thought it was in nice enough condition that it was worth giving away. When we came to look at the house, Vern showed me the dresser and I gladly accepted it. Yes, I needed that dresser to fulfill my Pinterest dreams. It took me forever to get around to doing something with it. I just couldn’t decide what to do. I thought about removing some of the drawers and putting in shelves. But no, I don’t have the tools or experience for that. 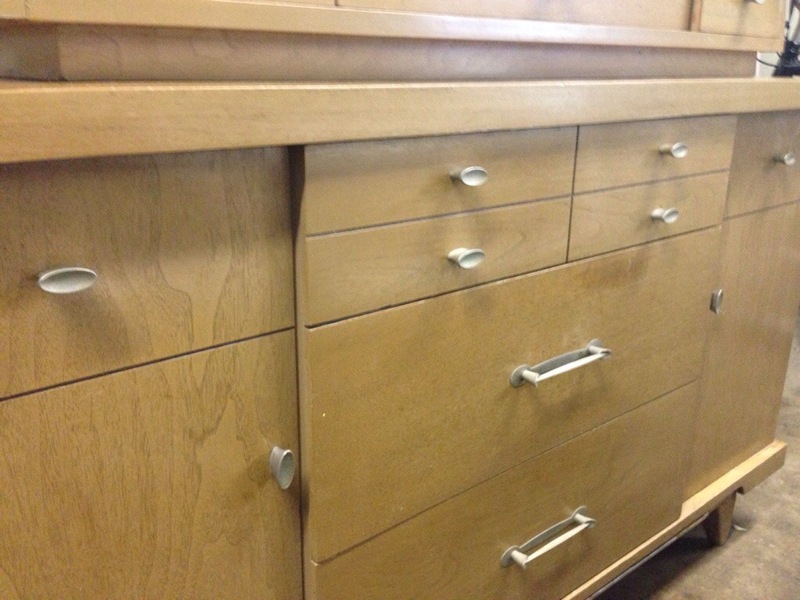 Then I thought about painting it and applying a textured paper to the drawers. But no, I don’t have the patience for that. So it came down to just painting, but I needed a color. I looked for inspiration everywhere, but kept coming back to the same answer: black. I love black. My younger sister tells me I wear too much black, but what does one do with their favorite color? Wear it all the time. Decorate with it. Black is classy and timeless and should be used without reservation. At least that’s my opinion. I used the same technique as my hutch. I sanded it down and then painted 3 coats. It was tedious work. I knew it would take several coats for the white to quit showing through. I was so eager to be done, I decided I would only paint the front of the drawers. That was until the incident. I don’t know how many coats in I was, but I was lost somewhere between the thoughts of what else I could paint black and just how tired I was. I was so tired. So tired that one minute I’m holding the can of paint and putting the last touch on a drawer, and the next minute my hand is empty and the paint has spilled out into the drawer and all over the floor. It was such a mess! The only way to salvage the drawer was to paint the inside of it. And if I did that for one drawer, I would have to do it for all of them. It ended up being a happy mistake. Except the paint on the floor. 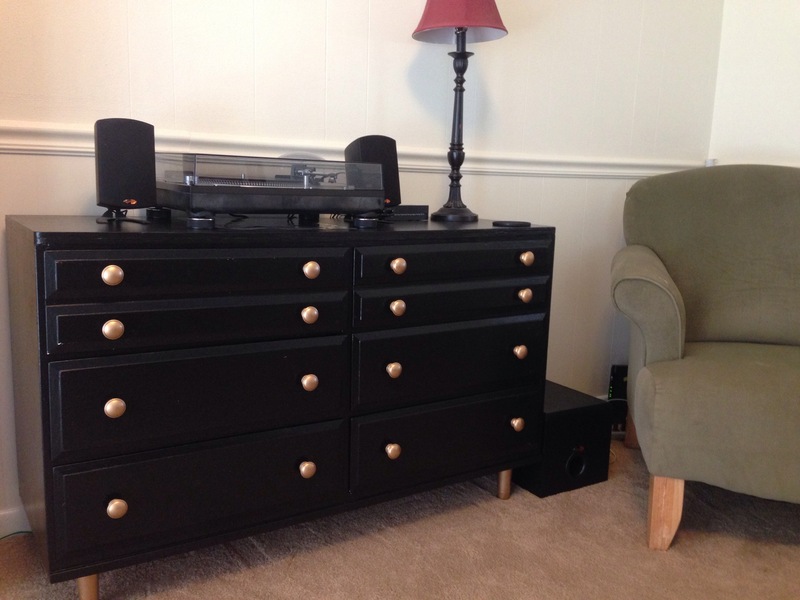 But it really did give the dresser a more finished look. Turns out sometimes you can’t take shortcuts. The final touch was the pulls. What I really wanted to do was replace them. 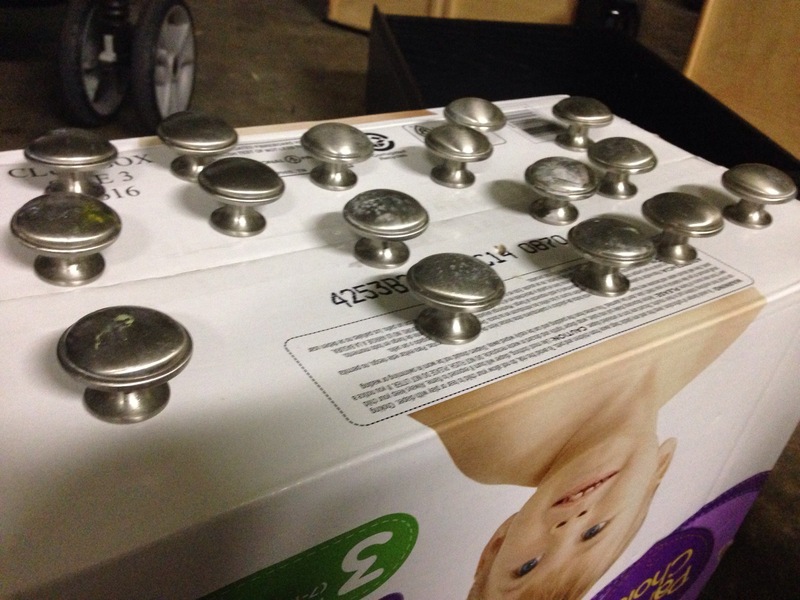 I had been looking at UFS and The Habitat Restore for something fun, fresh, and cheap. I had a lot of really good options, but nothing I couldn’t live without. It was going to cost another $5-$10 to replace the pulls. Not bad at all, but I couldn’t help think of how I could feed my family with that money. $8 will buy me a 10 lb bag of chicken quarters at Kroger. Or 3 gallons of milk at Aldi. 6 dozen eggs. Put into that perspective, it didn’t seem like I should waste the $8 if it wasn’t necessary. I would keep them, but not as is. Instead, I decided to look at what resources I had on hand at home. I had bought some gold spray paint for another project (waiting in my garage to be completed). I thought the gold would really make the piece pop and give balance to the black. In the spirit of not taking shortcuts, I decided to take the legs off and spray paint them as well. Holy cow am I glad I did! When Nick and I turned the dresser on it’s back, we found several spider eggs. I almost lost it. I don’t do spiders. Just the thought of those things hatching in my house…. Anyways, the dresser is finally complete! I absolutely love what it does to my living room. And it also gives me hope. 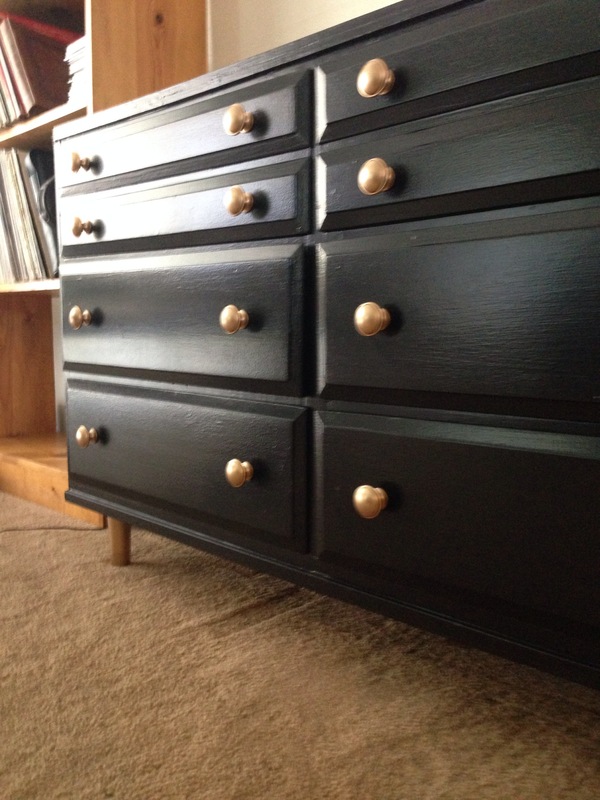 If I could take an old dresser and give it new life, what more can God do with me? The house I grew up in had a multi-purpose room. Officially it was the laundry room; unofficially it was the dog’s room and my mom’s craft room. There were cabinets lining one wall that were full of fabric. Some of it was leftovers from a project and others were intended for future use. My mom was really good at coming up with things to do, purchasing the needed materials, and then storing said materials indefinitely. We (my family) would make fun of mom relentlessly for this. I was in grade school when my mom made my baby pillow. There’s a quilt she was making for my sister’s wedding gift (9 years later and it hasn’t been started). I can’t even remember what else has been started and not finished or not started at all. I thought I had escaped that gene from my mom. I’ve never considered myself all that crafty, so I figured this wouldn’t be an issue for me. But two things happened to me: I had a baby and got a house. Only it’s not fabric I’m collecting, it’s furniture. If you were to come to my house, you would notice we have a two-car garage, but Nick parks in the driveway. At first it was because we had boxes from the move stored on his side of the garage. Those boxes are long since gone, but it’s been taken over by furniture. Since moving in, I have collected a dresser, patio chairs, a child-sized armchair, two medicine cabinets, a chandelier, and a hutch. All of which need to be painted, stained, or installed. The only problem is I have spent more time on Pinterest coming up with ideas for it all than actually working on anything. 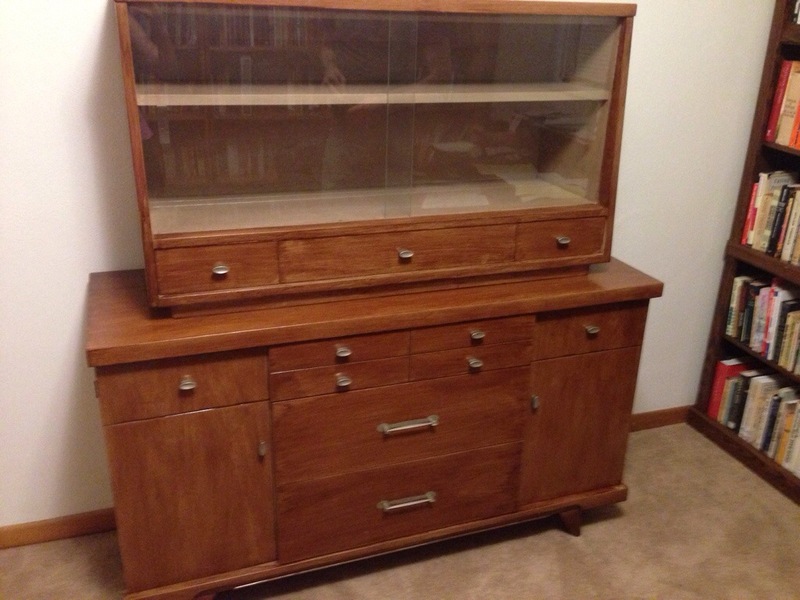 The hutch had been give to us by a couple in the Bartonville church. It had been his grandpa’s, but when they got married he sold them a table and chair set, the hutch, and the dishes in the hutch for a mere $100. Now this was the 60s, but even then $100 was a steal. 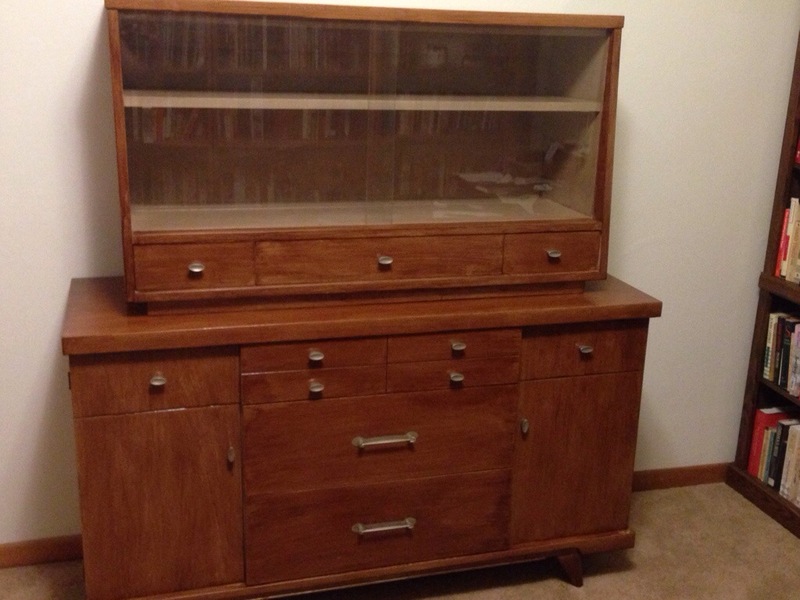 They had kept the hutch all these years and finally decided it was time to get rid of it. They offered it to us, and otherwise it was going to be donated to a thrift store. At first sight, I knew I needed this hutch. Not for what I could do with it, but for what I could do to it. I had contemplated painting it, but every color I envisioned (usually black) just looked horrible in my mind. I also had this fear I would disrespect the couple by altering it too much. I mean, they had given it to me so it was mine to do whatever I wanted. But it has a history and I felt the need to preserve that as much as possible. So thanks to Pinterest, I found a tutorial on how to stain furniture. I’m not going to reinvent the wheel by giving my version of how I did it. Someone else already did that for me and I just followed her instructions. But there are a few observations I’ll make on the process. For one thing, I am waaaaaaaay too literal. As I was getting started, I read the tutorial over and over again and checked the can of stain numerous times to see if I needed to stir or shake the stain before I started. Neither one told me to, so I didn’t. I’ve never worked with stain before, so if I wasn’t told to do something I wasn’t going to do it. Stupid. I dipped my brush in the stain and started on one of the drawers. Now my can says espresso, but what I painted on was clear. What kind of sorcery was this that would go on clear and then dry a rich espresso color?! But none of the instructions said to stir, that contents might settle, so I kept going. I painted every drawer and started on the base. But the feeling that something wasn’t right kept haunting me. BUT IT DIDN’T SAY TO STIR! When my conscience could take no more, I tried stirring the stain. Imagine my surprise when the contents turned a beautiful brown. So I had to go over all of my work again, just in order to actually stain it. Stupid. Also when embarking on a journey like this, always keep the destination in your mind. I kept working on each piece as an individual piece and forgot that they were part of a bigger picture. Had I paid more attention to it as a whole, I would have noticed how there are stripes of wood along the drawers that should have been stained as well. Or that just because the doors will normally be shut doesn’t been they’ll never be opened, so you might care more about the other side of the door. You know, little stuff like that. But all in all, I overcame my fear of staining and my “mom” genes and completed a project. The best part was being at the open house and having the couple tell me how beautiful the hutch looked. The husband told me his grandpa would have been proud; I could have cried.